It's that time! We are hiring. DEADLINE for applications is April 21, 2017. Be an Art Biker this summer! We are looking to fill one position on the team. We hire on the basis of merit and are committed to employment equity. We encourage all qualified persons to apply and self-identify. 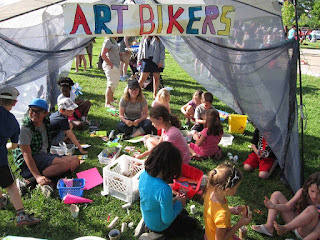 Riding bicycles and pulling trailers packed with materials and supplies, the Art Bikers travel throughout the HRM engaging children, youth, and neighbourhood residents in free, fun public art activities. You are highly creative and physically fit, with solid urban bicycling experience. You have strong visual arts and/or crafts skills; excel at working as part of a team; and are available to work irregular hours including weekends and early evenings for the entire season May to end of August. Strong legs, an open personality, playful spirit, and abundant energy are essential. Experience working with children or camp counsellor experience considered an asset. You own an urban road bicycle in good working condition and are prepared to ride & work outdoors in all types of weather. DEADLINE for applications is April 21, 2017 extended to April 24th by 5 pm. Late applications will not be considered. For the 2017 season, Wonder’nearth Art Society http://www.wonderneath.com/ will partner with 4Cs Foundation by providing the coordination and studio location for the Art Bikers program. 35 hours per week at $15.00 per hour, plus $100.00 Bike fee at end of contract. This is NOT a 9 to 5 Monday to Friday job. You must be available to work weekends, evening hours, early mornings, as well as daytime hours. Your work schedule will change on a week-to-week basis. You can count on working at least one day per weekend. We do try to schedule two days off together each week but these can vary to be at any point in the week depending on the program delivery. You must be available for the entire season - May 15 to August 26, 2017. You are energetic, fun, and creative. You like to meet people, work with children, and be outdoors. You are physically fit. You are committed to teamwork. Experience working with children/youth in workshop, classroom, camp, or community-based settings. Visual art-making and/or craft skills. Additional arts skills (theatre, music, etc.) considered an asset. Physically fit – able to ride at least 25 km pulling a loaded, heavy trailer and be able to work outdoors in all weather for long periods of the day - also bending, lifting, and sitting on the ground comfortably. Extensive urban biking experience and a high level of comfort biking in traffic. Own and ride a hybrid bicycle that is in excellent working condition. Be comfortable leaving your attachment to your personal art practice and your personal identity as an artist behind in order to facilitate others engagement with art making at a community level. Work for the duration of the contract from May 15 to August 26, inclusive. Be adaptable, outgoing, quick thinking, and possess excellent judgment. Able to safely use basic tools like saws, hammers, electric drills, etc. A playful spirit and a good sense of humour. Want to learn more about community-based arts and community arts. Knowledge or experience in arts-based community development, community development or Adult Education Principles. Experience working openly and honestly as part of a close-knit team. A second language other than English. Knowledge of bicycle maintenance and repair. Please send a cover letter telling us how your personal qualities, experience and education matches what we are looking for, and your current resume. Include any related volunteer experience you may have. We do not need a curriculum vitae, however if you have a website of your artwork, please include the link. Please include three references and their contact information. Subject line: Your Name and Art Biker Application. Label attachments with your name. Email your cover letter and resume by April 21, 2017. Late applications will not be considered.